The Universities & Colleges Employers Association (UCEA) said there had been a "marked narrowing of the gap over the past decade". It said it had worked with member organisations "over many years" on the issue. 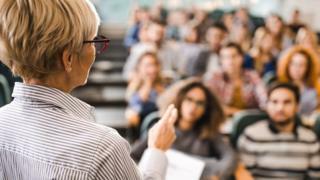 "All HE [Higher Education] institutions have been supportive of this and have focused their own work to develop a better understanding of practice and trends... and to explore effective interventions and actions to try to close the gender pay gap," it added. A spokeswoman for Harper Adams said that the university's pay gap had narrowed in the past year and that it had taken external advice to try to address the issue. Many universities also report a high bonus gender gap - the difference between what men and women are paid in bonuses. The University of Liverpool has a 87.6% bonus gap and Newcastle University 80%. "The overall civil service gender pay gap continues to narrow and we will continue to work hard to balance out wages at all levels of government," it added. Meanwhile, 78 councils have reported that they pay women more than men. Three Rivers council in Hertfordshire has a 50% pay gap - in favour of women. However, the pay gap does reflect differences in men and women's working patterns, with part-time roles being predominantly female - and a lack of women in senior roles.